Home > Safety > What Should I Wear When Travelling Alone? (3) you'll need to think about your personal safety when you dress. This might seem like a lot to remember every morning, but by streamlining your wardrobe before you leave home you'll know that anything you throw on will satisfy all of your criteria. The weight of your wardrobe will directly affect how much luggage you can carry and how many layers you can wear at any one time. When you travel alone you will want to keep your luggage as light as possible so that you can move it yourself if you are left stranded without help or luggage trolleys. Depending on where you travel, pulling or pushing your luggage in a suitcase may be an acceptable compromise for packing a bit more but some areas are more conducive to backpacks or duffel bags than suitcases. If you pack heavier clothing too you'll have to limit the number of items you bring, which means fewer options and more laundry to do while you travel. If possible, try to bring along a number of lightweight options that you can layer together to give yourself plenty of options, and if possible look for fabrics that don't wrinkle or rip easily. The more wear you can get out of each item the less worrying you'll have to do about finding laundry services or replacement items when you are travelling alone. When travelling alone it is advisable that you try to blend in with the society they are visiting. Before leaving home find out what people wear when they are out shopping, visiting local attractions, attending religious services, at the beach and dining out. Once you know what everyone else will be wearing you can pack clothing that will match local wardrobes. If there are items of clothing you need that you cannot find in your local shops, for example headscarves for women, call around to shops in larger cities, to community groups that might be able to help or make a plan to pick these items up when you arrive. Calling ahead to a hotel or specific shop will likely help you track down hard to find clothing as well. You may find an attractive sarong will double up as head wear or shoulder covering as well as the usual handy cover-up on the beach. Remember too that not only do you need to wear clothing that matches the same level of formality as everyone else's but the same styles as well. Try not to wear flashy designer clothing or clothing that is cut lower, higher or more clinging than others' clothing. Also refrain from layering on expensive accessories, more make-up than local women would wear or heavy perfumes that might not be appreciated. Some items, such as athletic trainers, baseball caps and sports t-shirts or jerseys, can also mark travellers out as tourists and should be avoided. Dressing for safety is of paramount importance when travelling alone. No matter where you are, remember that your appearance might be analysed for any number of reasons. Take care to protect yourself by wearing clothing or accessories that allow you to secret your cash in different areas, carry a charged mobile phone at all times and protect your passport and other identification documents. 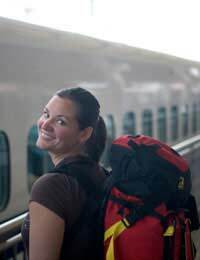 Many solo travellers find that a sturdy daypack or bag can be a good way to carry important items, but make sure that such bags have strong straps, inner pockets and that you carry them across or in front of your body to minimise opportunities for others to get inside. Also remember not to store important items in outer or side pockets that can be more easily accessed. When you sit down, keep the bag between your feet with a strap looped around your ankle so that you can feel any movement. Women may also want to wear a "wedding band" to discourage unwanted attention when they travel. What you wear when you travel alone can have a very real impact on the success of your trip. Solo travellers should think about wardrobe weight, dressing for comfort and style as well as dressing for safety before they even leave home so that every item of clothing they bring on a trip can contribute to more enjoyable travels.